Wow Love this LO. Can't even believe how time flies and your son is all grown up already. So so beautiful,Katie!! I love this Layout!! The banner looks aamzing here!! 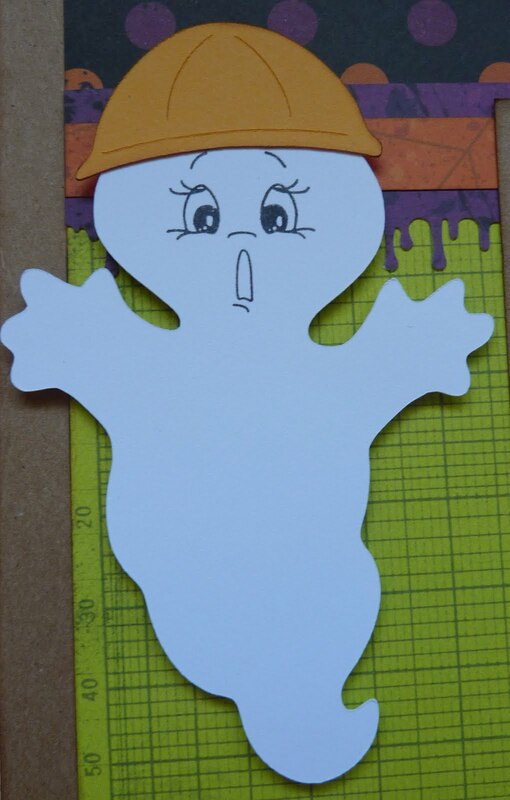 The ghost with the hardhat is too cute!! Awesome!! Cute photos!!! Plus your kiddos are so adorable! Great LO!! Awesome Banner!!! TFS!!! That ghost with the hard hat is sooo cute. Love this layout!! 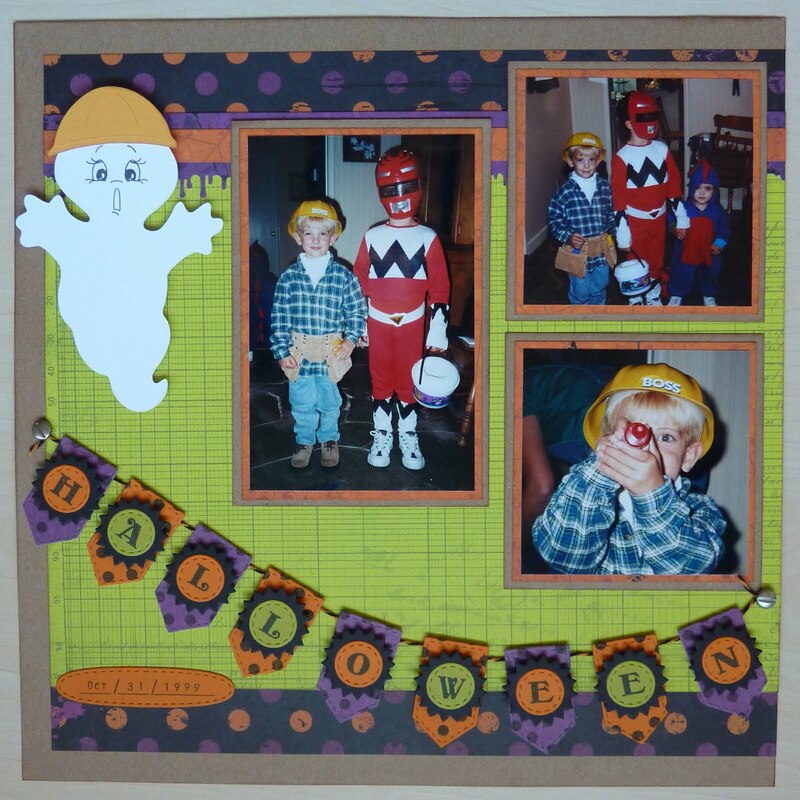 Fantastic layout Katie...and the ghost with the hardhat to cute!! How cute is this! Love the banners and the pictures are just precious! What a fabulous layout!! Too cute!! What a cute LO!!! I absolutely love your lil ghost worker!!! So cute! Love the banner too!!! Great job! What a cute LO, I absolutely love the ghost and the banner. This banner is perfect for your layout! I love this. I will have to try it out! Oooh this layout is so sweet, love love that banner and it all goes together so well. Adorable layout love that banner yoo cute! I am loving all the cards and the new releases. Darn you gals and these awesome projects. This is the first time I have had to HAVE a stamp/die set, but this banner set is just TOO AWESOME to pass up! GREAT job! Loving your layout and how you used the banner. The colors are great too. Awesome Layout!! I love how you did the title as a banner!! So clever! Such a cute LO!! i heart Halloween! great job! 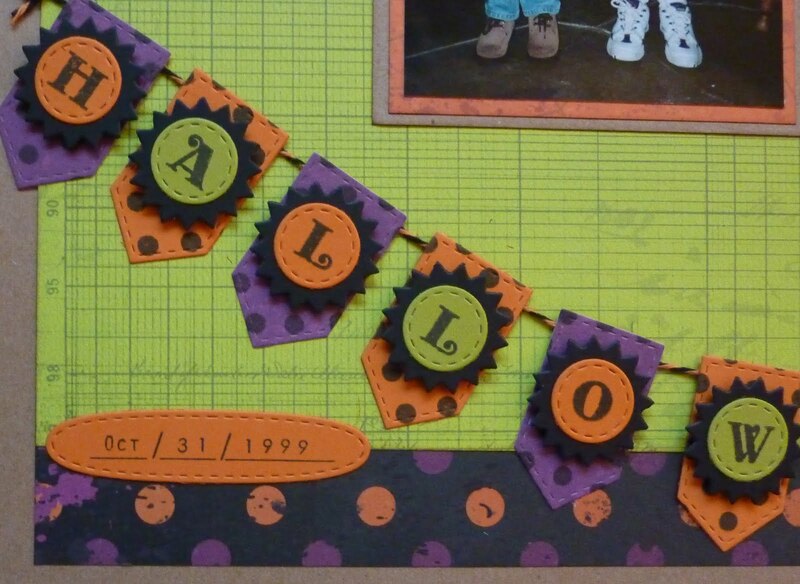 Lovin' the banner - great idea to use it as a title on a scrapbook page!!! Can't WAIT to get my hands on this one!!! Great Halloween layout. The colors and design are just perfect. Oh Katie, this is just so cute... love that little ghost... Love love Miss Emma's new stamps... she is amazing..
Awsome layout, love the ghost!!!! What an adorable LO! That little ghost is the cutest! this layout is so darn cute! love it...thanks for sharing all of your projects with us this week! I have loved them all!! TY for sharing a layout! Its nice to see the size on a page!!! Love the title banner!! And the hardhat on the ghost is too cute. Fab page, Katie!! Also love layout ideas using stamps and dies, so thanks for this project. Emma's Design Team has to be one of the most talented group of ladies. Such wonderful projects. I always love how Emma ties all of her releases together and you members show us how to create some wonderful projects. Love the layout and the how you used the banner!!! Thanks for sharing with us all week!!! I just love this banner set!!! I love the ghost with the hard hat...so clever! Great layout page...this set is perfect for so much. I see you have used Emma's favorite ghost. Darling page. Awesome, awesome job. Love it. The ghost is just adorable. Really love the colors. Adorable. I love the layout. Great job. Nice banner. These stamps are awesome. I love how you also decorated the ghost . Super cute LO!!! The ghost is adorable!! Love your layout! The banner looks great and love the stitched oval. Hey Katie I love your layout the colors are awesome together. I like these Halloween colors. Very cute LO!! I love it!! Love the banner idea, seems like is a lot of fun to play with! TFS a great LO. Have an incredible day! I have got to use my paper doll cartridges more. Your ghost is just so cute! Great layout. Love the banner and the ghost. Love the layout...great idea! Thanks! What a cute Halloween layout. So fun and festive. Great layout! I love the banner!! What a great layout, love the colors. Super duper fun lo!!! This banner set looks like a must have!! Katie I love the construction worker ghost. How cute is that. A wonderful job showcasing her amazing new stamps. OMGosh Katie, this is just too cute!!! That little ghost with his hard hat..lol Great layout, I can see this set is so versitile!!! Love the Halloween banner layout, can't wait to see the new release. Perfect banner for a Halloween layout. Fun cute layout! Thanks for sharing. Such a sweet LO! I love how to shaped the banner. Love how you curved the banner title. Love, love, love this adorable layout. That ghost is just the cutest with his hardhat. Very nice layout! I really like the date stamp at the bottom. Love the project. These stamps are just wonderful. Emma has done a wonderful job.